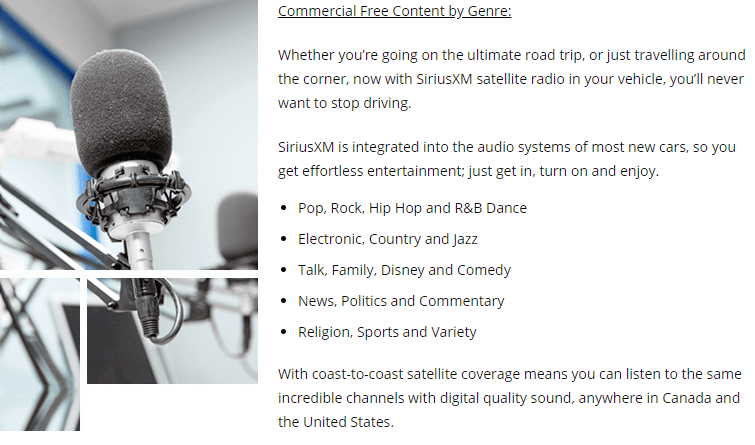 SiriusXM Features Endless Commercial Free Audio Entertainment – 24/7! Business Elite Dealer | Commercial Link | Onstar Connectivity | Premium Infotainment | 2019 GM Fleet Guide – DOWNLOAD NOW! SiriusXM satellite radio features endless audio entertainment with exclusive programming available in your car, your home, and on the go. Subscribers have access to over 200 commercial-free music, artist-dedicated channels, the best in talk, entertainment and the most comprehensive news and sports coverage available all day… everyday! Over 5,000 Hours of On-Demand Content and 200+ Channels! Listen. Anywhere. Stream SiriusXM online, on the app, and on dozens of connected devices, plus get thousands of hours of on-demand content. Questions about Sirius XM Satellite Radio? Great! We’ve got answers!